By the end of 2016, vehicle traffic on the Gabriola ferry route will have increased almost 4% over 2015, and passenger traffic will be up nearly 2%. BC Ferries will tell us it’s down to a weak Canadian dollar attracting more visitors from south of the border, and more Canadians taking their vacations at home – and to some degree it is, but what do these figures actually mean for Gabriolans facing ever longer line-ups for our ferry? BC Ferries data isn’t always straightforward when it comes to comparing like with like (no surprise there then, I hear you say). The corporation reports by fiscal year (FY) ending in March, which means some years include one Easter holiday, some (like FYs 2008, 2013 and 2016) have two – and typically the following year will have none at all. For that reason, the FAC usually monitors ferry traffic by calendar year to iron out the “Easter effect”. Another complexity is BC Ferries’ method of counting vehicles. Each month they publish actual vehicle numbers (counting every vehicle as 1, irrespective of size). 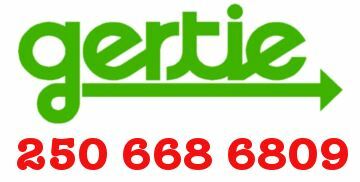 By the time the annual reports are published, vehicle numbers have been converted to AEQs (automobile equivalents) where commercial vehicles and buses count as 2 or 3 AEQs, depending on size. So, at the year end, the reported numbers using Route 19 are inflated by around 5.5% once they are expressed as AEQs. Simple, or what? So let’s take a look at how 2016 (and, from what we are seeing, the remainder of this fiscal year to March 2017) actually compares to previous years. A quick glance at our Route 19 Performance page will reveal that 2016 has been the busiest year for vehicle traffic since 2012 – and there’s been a 6% recovery in traffic levels since the ferry cuts of 2014. By the end of the FY 2017 on March 31, we can expect more than 350,000 vehicles (370,000 AEQs) to have used our ferry. That’s up from 345,000 AEQs in the year following the cuts – but don’t forget, ten years ago, we were talking about 418,000 – so there’s some way to go yet. It’s a similar story when it comes to passenger numbers, which have been in progressive decline for more than ten years, and hit an all-time low in FY2015 with the double whammy of service cuts and the ending of free travel for Seniors. By the end of the current fiscal year, around 780,000 passengers will have used the ferry – up more than 4% from FY 2015, but still almost 100,000 less than travelled 10 years ago. It’s clear to see that, for now at least, the decline has been halted and we’re starting to see some real traffic growth. But we now have fewer ferries each day than we had before 2014, so the remaining ferries are starting to look much busier. Is that really the case? Summer 2016 also saw the reinstatement of some weekend sailings on a two-year trial, and BC Ferries seemed positive about the results when they met with the FAC in November. But how much of the extra traffic was new traffic, and how much had migrated from earlier or later sailings? With the benefit of detailed figures supplied recently by BC Ferries, we can now start to build a more accurate picture of what’s really happened in 2016. So the short answer is a bit of both. Compared to the 4% underlying growth in traffic in 2016, daytime traffic leaving Nanaimo on Summer Saturdays increased overall by 10%, while daytime traffic volumes increased by around 12% on Summer Sundays. Effectively, 3 out of every 4 vehicles carried on the enhanced daytime service represented new traffic. Did the number of vehicles increase on weekdays as well? The short answer is yes – and no. On Mondays to Fridays, trip patterns are quite different, with a much higher proportion of daily commuters on sailings before 8am from Gabriola, and leaving Nanaimo between 3.30 and 6.30pm. There was no significant increase in the number of vehicles leaving Gabriola before 8am – and only a 2% increase (typically 5 extra vehicles) leaving Nanaimo in the afternoon peak. Daytime traffic leaving Gabriola between 8am and 3pm increased by about 2% compared to 2015, with the pace of increase growing progressively from 1% in May and June to 3% by September and October. From July onwards, there was evidence of a higher rate of increase in traffic leaving Nanaimo during the daytime, rising from 1% in the Spring to 7% in July and August and falling back only slightly to 6% in September and October. A similar increase was seen in the number of vehicles leaving Gabriola between 3pm and 6pm over the summer, with up to 18 extra vehicles visiting Gabriola each day from Nanaimo. Was the improvement consistent across the week? Traditionally, traffic volumes on the Gabriola ferry peak on Thursdays (the last day of the 50% concession for seniors), with Tuesdays and Fridays lower by around 5%, while Mondays and Wednesdays are typically about 12% below Thursday levels. 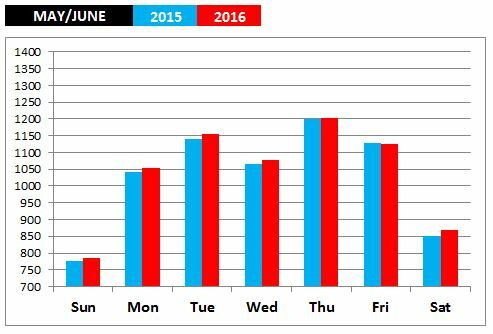 Until the end of June, most days of the week were experiencing a 1% increase in traffic volumes compared to 2015. 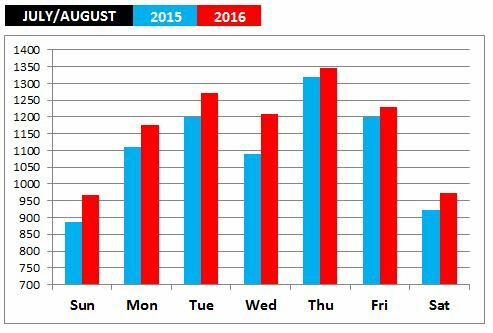 Then, as summer peaked, the busiest days of the week showed the smallest increase (there’s a finite number you can squeeze onto Quinsam, evidently) while the traditionally quieter days were catching up fast, as the graphs below demonstrate. Each graph shows the average number of vehicles carried per day in 2016 compared to the same period in 2015. The net result as traffic volumes increased during 2016 was that Tuesday, Wednesday and Friday became almost as busy as Thursday, with Thursday itself already running close to capacity and virtually unchanged. 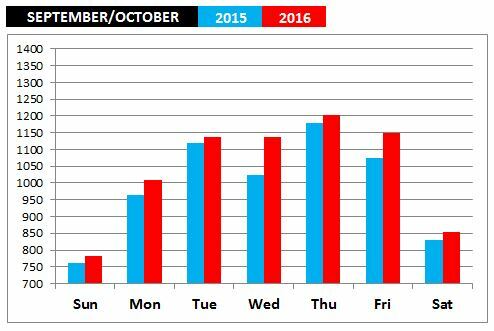 By the fall, Thursdays had seen just 2% traffic growth and traffic on Tuesday, Wednesday and Friday was rapidly approaching Thursday levels. Wednesdays have consistently seen the highest growth in volume (around 10%), despite the reduced number of sailings caused by the dangerous cargo schedule and evening refuelling. As our latest Best Times to Travel graph demonstrates, even in September we were seeing regular overloads over four or more successive sailings from Gabriola between Tuesday and Friday. Our ferry simply cannot accommodate more traffic at these times, and if traffic volumes continue to rise, the problem will only get worse. How did the evening services fare? The analysis remains “could do better”. Each month this year, there has been a different evening that has ‘bucked the trend’ and demonstrated the opportunity to “grow the market” for the evening services from Nanaimo to Gabriola. However, the fact remains that demand for evening services remains stubbornly low – especially on the 10pm and 11pm sailings. Despite the best efforts of the FAC, BC Ferries has maintained its resistance to discounting fares as a means of increasing evening traffic. So what do we do? We have ferries that (even in mid summer) are less than 30% full, while daytime services are under ever increasing pressure. There’s no easy trade-off, of course, as Quinsam already works flat-out throughout the day to maintain the present service, and for those who do use the late evening service on a regular basis, those sailings are every bit as important as the daytime runs. The uncomfortable fact remains that (in the eyes of government, at least) our late evening ferries are very much “bottom of the league table” if the need for further efficiency savings ever comes. The community made their priorities clear to government in 2013, and again in 2014 when the FAC asked BC Ferries to restore the heavily used daytime service. Those priorities guided the design of our ferry schedule in 2014 and 2015, but the fragility of the evening service remains a constant concern. And what for the future? If our ferry service was once seen as a sick patient, it’s certainly showing the vital signs of improvement now. But does the patient have the ability to sustain that improvement if the demand for service continues to grow? I’m not so sure. The problem is this. Each time the demand for service increases, that increase is focussed around the very times when the service is already running at, or very close to, capacity – times of day when our present ferry simply cannot deliver more space (for vehicles, at least). There is no slack in the ferry schedule, and on an increasing number of sailings the ferry is routinely full. During 2016, we have seen how demand has moved to fill space on previously quieter days, and undoubtedly we will see that continue into 2017. But there is a limit to how long that can continue. Saturation point is perilously close. 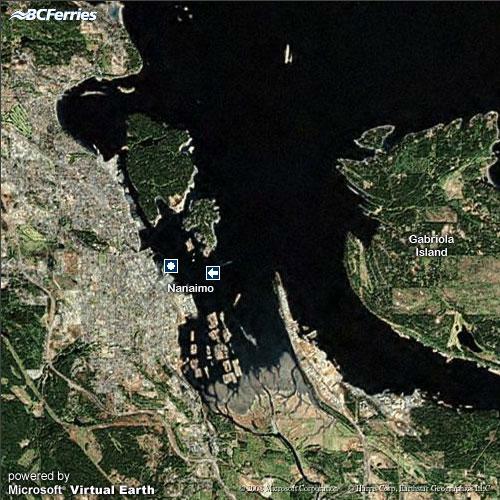 What we need now is a creative dialogue with BC Ferries on how to accommodate any future growth in demand. Simply demanding a return to the service provided before 2014 is not the answer. We need extra capacity during the daytime, not in the early morning or mid evening. Maybe we need a larger ferry, or even two smaller ferries running a more frequent service? Or maybe we need BC Ferries to acknowledge their limitations and partner with Gertie, RDN and BC Transit to develop more robust alternatives that will reduce our dependence on the car, releasing space for those who have no option but to drive onto the ferry. One thing is clear. BC Ferries will need to address this challenge soon.